I’ve always enjoyed this event, in which artists are invited by St. Luke Artist Colourmen to make an artwork (most commonly, a painting) on a wooden palette. The preceding exhibition was held in 2010, when my palette Behind the Mask was judged the "Most Exquisite". My prize, a voucher for art materials, was spent over an extended period of time, primarily on a range of acrylic paints. Ironically, many of these have been employed in the making of my 2013 entry, which is previewed above. The profile portrait that appears in the upper right hand corner of this blog features an earlier palette, made originally for the second Exquisite Palette exhibition in 2008. As I’ve previously asserted, play is an essential ingredient in any artist’s practice; using a more relaxed mode of expression, many do some of their best, most imaginative work. The successive Exquisite Palette exhibitions have certainly been testament to that. Personally, I always relish the self-imposed test of how to incorporate the palette’s hole into the composition. My painted palettes have evolved as a thematically linked series, drawn from an extensive repertoire of insect and mask iconography. The masks and the basic artist’s tool upon which they are painted combine to reinforce the notion of artifice. And of course, the masks’ peepholes perfectly meet the challenge of the hole in the palette! This exercise has also reminded me of what a sympathetic painting surface wood can be, especially for finely detailed work, and has cemented my determination to use it more often. For further information, visit the St. Luke Artist Colourmen blog HERE. The exhibition will run for a month. A friend has just brought the above photograph to my attention. It's from the feature article A Weekend With Helen Gory, which appears in the current issue (March 13) of Inside Out Magazine. The article focuses on Melbourne gallerist Helen Gory’s private art collection. 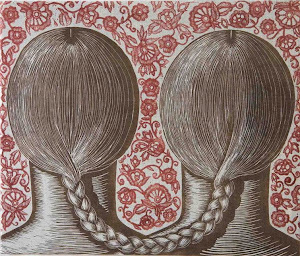 On the wall behind her to the left is my print Lydia the Tattooed Lady (1995, linocut, 89 x 60 cm). Photograph by Derek Swalwell. More about Lydia in a future post. Click on 'latest issue' in the menu and go to page 30. The 23 Corporeal artists are: Graeme Drendel, Di Ellis, Philip Faulks, Rodney Forbes, Sue Fraser, David Frazer, Rona Green, Rew Hanks, Kaylene Kelly, Michael Kempson, Alexi Keywan, Martin King, Deborah Klein, Terry Matassoni, Ron McBurnie, Janet Parker-Smith, Travis Paterson, Ben Rak, Heather Shimmen, Stephen Spurrier, Anne Starling, Clayton Tremlett and Scott Trevelyan. 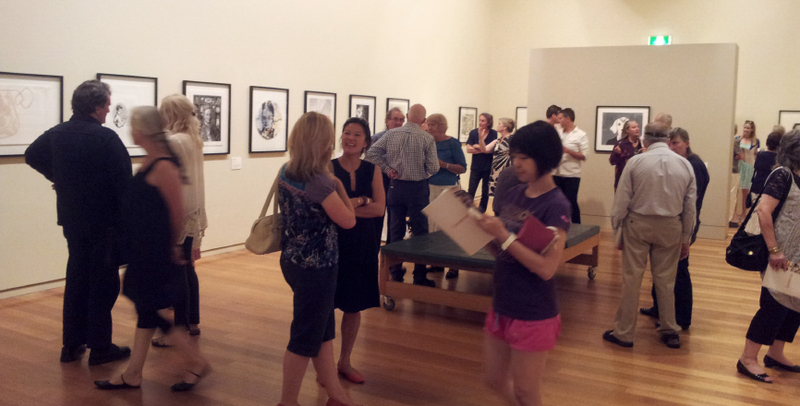 Pictured second from top is a snapshot taken at Geelong Gallery on the opening night. Photograph courtesy Rona Green. For more information, visit Geelong Gallery’s website HERE. Better yet, go along to the gallery and see the show. Corporeal runs until 12 May. Although I’m currently juggling several projects, my primary focus remains on Tall Tales, an ongoing suite of one-of-a-kind artist’s books. Here are the first two, The Maiden Flight and A Tall Tale. 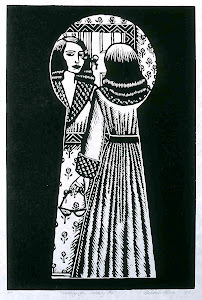 To learn more about the project, visit my books and zines blog Moth Woman Press HERE. Pictured above: The Maiden Flight and A Tall Tale, each 2013, unique concertina books, ink and acrylic paint on Khadi paper, 80 x 15 cm (open). Photograph by Tim Gresham. Opinion polls continue to list the Moth Woman Vigilantes Apolitical Party as clear front runners for the September Federal Election, fuelling further dramatic upheavals within the Australian Labour Party. In Melbourne this has just culminated in the shock resignations of two key ALP Members. 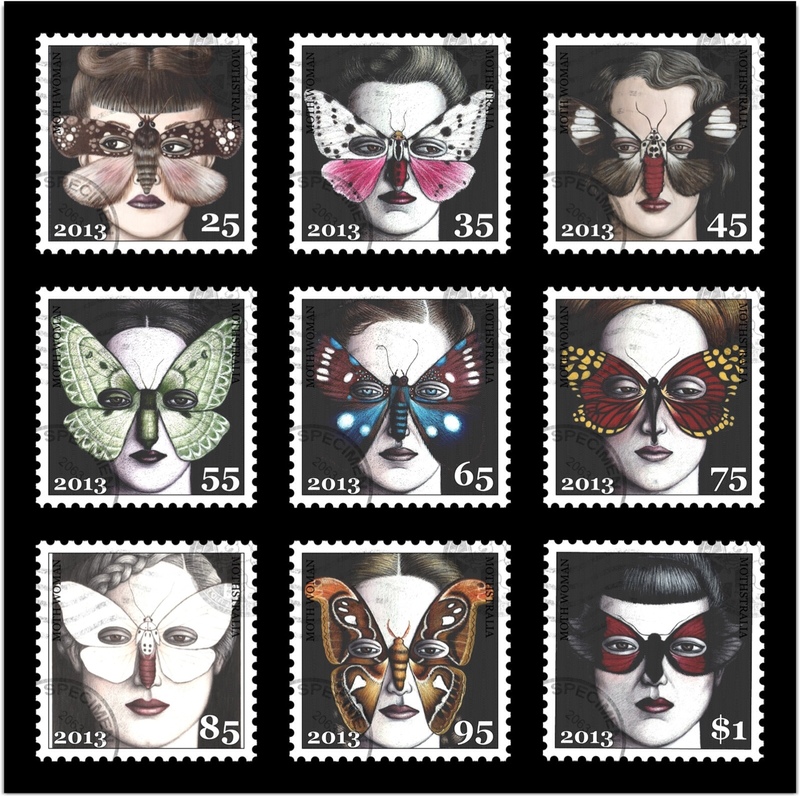 With an election victory virtually assured, the Moth Woman Vigilantes have commissioned a set of Mothstralian postage stamps (see below). Their intention is to ensure that the transition to Independent Republic of Mothstralia is as seamless as possible. The MWV have received an avalanche of advance orders from philatelic societies, philately students and stamp collectors worldwide. As readers of this blog will be aware, a set of MWV Coins of the Realm has already been minted. (See Blog Post Thursday, February 2). The 2013 Mothstralian postage stamps are previewed below. Original artwork by Deborah Klein, completed in the iPad Face on Stamps app. 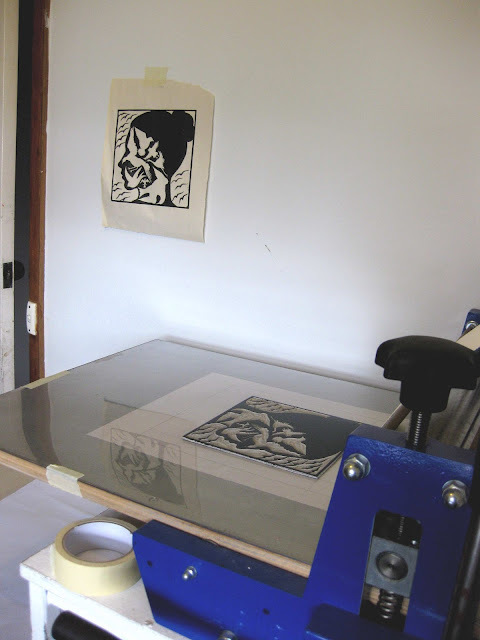 Last week I editioned the linocut Flight. (See previous Blog Post). Tomorrow, all going well, it will be winging its way to Granada for Impresiones Gigantes. 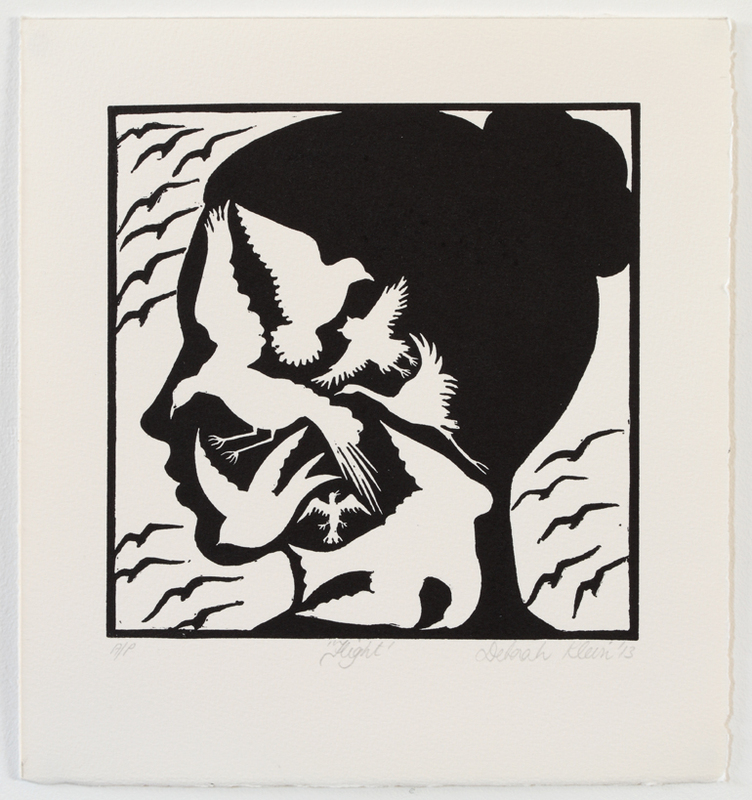 Flight, 2013, linocut, 18 x 18 cm. Photograph by Tim Gresham. Further details, including a direct link to the event, will be posted shortly. For a list of this year's international artists, click HERE.